Soon Suriname could be one of the major footballing powers in the whole of CONCACAF. The key word here though is could. It depends on whether a bill submitted to the country’s government in January asking for dual nationality is to be accepted or not. As things stand, a person born in Suriname – a former Dutch colony – who decides to leave for and live in the Netherlands will lose their Surinamese passport. And likewise, a person born in the Netherlands with Surinamese descent can only be in possession of a Dutch passport and nothing else. However, we should know by February next year if this current policy is to be abolished and make way for a dual nationality system. If so, it could spark a revolution in Surinamese football. Languishing in 164th place in the FIFA World Rankings, behind nations such as Swaziland, Laos and Madagascar, the national team is not in a good place. De Natio disappointed at the recent Caribbean Cup first round qualifying, finishing rock bottom of their group having registered zero wins and losing to rivals Bonaire along the way. The Surinamese Voetbal Bond (SVB) has identified that there’s a problem and are willing to address it. Cue ‘Project Suriname’. The small South American country, but a member of the Caribbean Footbal Union (CFU) since 1965, has never qualified for the World Cup. The closest they ever came was in 1977 when the team reached the final qualifying phase for the ’78 finals in Argentina, but they just fell short. Project Suriname aims to change this by targeting a spot at Russia 2018 and do it with a combination of Dutch professionals with Surinamese roots and local Hoofdklasse (top domestic league) players. In theory the combination could be devastatingly effective. Already the SVB has outlined its vision by holding a press conference last Friday detailing the federation’s ambitious plan ahead of 2018 World Cup qualifying to start in the summer of 2015. Former team manager of Ajax and current Dutch sports journalist, author and columnist, David Endt, is firmly on board and spearheaded that press conference. So to is Dean Gorré, born in Suriname’s capital Paramaribo and a former player starting his career in the Netherlands prior to ending it in England, who has been appointed national manager on a temporary basis. He will take charge of the home match against Trinidad & Tobago champions W Connection on Boxing Day which has been arranged by the SVB in order to usher in some of the overseas-based players and inspire people to encourage the project. It will present the perfect opportunity for Gorré and the players to show that the combination can work and a positive performance is key for the benefit of the bill. Indeed, there is a large amount of players all over the world who are eligible to put on the Surinamese strip. Most were born and are plying their trade in the Netherlands – there was huge emigration back in the 197os – but the list stretches to Romania, Cyprus and Bulgaria. It was important that the SVB could track them down and to do that they hired Nordin Wooter, born in the Netherlands to Surinamese parents and a former player, who runs his own academy called Wooter Academy. Occasionally he does training sessions and clinics in Suriname and maintains a strong admiration for the place. He was given the job of identifying eligible players and contacting them. A list of the top 100 was drawn up and Wooter sent out 100 letters, receiving 85 positive replies. Among them was 28-year-old central defender Milano Koenders of Eredivise club Heracles Almelo, who has been touted as a possible captain for the long-term future. He will be skippering the side against W Connection in a couple of weeks after his club have granted him permission to fly out. Unfortunately, many players who expressed an interest have not been allowed to join up with the squad over the festive period by their respective clubs, most notably Marvin Emnes (Swansea, England), Ryan Donk (Kasımpaşa, Turkey), Virgil Misidjan (Ludogorets, Bulgaria) and Darryl Lachman (FC Twente, Netherlands). 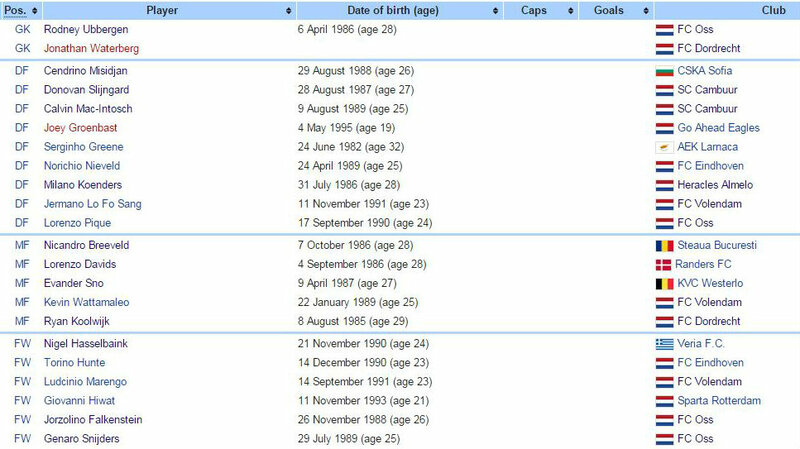 Of course, should Suriname gain dual nationality, then these players would have to be released for World Cup qualifiers and any other tournaments played on FIFA dates. So the issue is clearly not with the players as they’re enthusiastic and open-minded. It is instead, perhaps, with the government. For a long time the Surinamese government has been strict on its nationality laws and refused to accept dual citizenship as a way of marking down its territory to the Dutch, who controlled Suriname up until independence in 1975. That is why it is hoped in parliament this state of affairs will be resolved and the future will start to look brighter, especially in a sporting respect. Furthermore, the overseas professionals that Suriname are monitoring are all more or less in their prime. As Sport Preview NL noted: “They are, except the young and talented Virgil Misidjan [aged 21], all between 24 and 29 years old, the peak years of the adult male.” This certainly bodes well for the future with a particular focus on the next World Cup where, if this team was to be assembled for qualification, players would be performing at optimal fitness levels. As for the domestic contingent, it can only be assumed that the SVB will select younger, fitter individuals who can contribute an equal amount. Where would Suriname rank in CONCACAF? If everything went to plan then, undoubtedly, De Natio would be one of the very best teams within the confederation. On paper, anyway. At the moment Costa Rica top the CONCACAF standings, followed by Mexico, United States, Trinidad & Tobago and Panama to make up the top five. A team consisting of Lachman and Koenders at the back, Sno and Misidjan in midfield and Emnes up front would in theory be on par with those sides. Other factors are the manager – will Gorré remain the boss? – and the organisation in terms of fixture regularity, off-field management and fan base. There is no definitive answer yet. 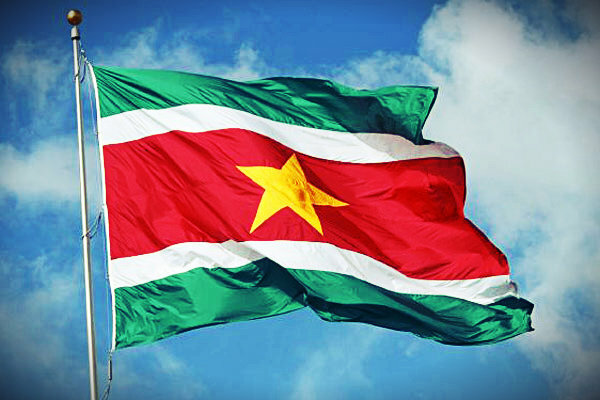 But this has been a long time coming for Suriname, the same country which has produced some of the world’s most revered footballers such as Clarence Seedorf, Edgar Davids and Jimmy Floyd Hasselbaink. Each time the Netherlands has profited and enjoyed the glory. Now it is time for Suriname to shine, and the decision to be made in parliament early next year will be one of the country’s biggest to date. Really enjoy reading your blog. I’ve recently started up http://www.footballphotos.co.uk and was wondering if you’d be willing to do a link exchange. I think your site is an excellent read and would really love to hear back from you about a reciprocal link. Hello Stuart. Thanks for getting in touch and your kind words are appreciated – I’d be interested in the details of your proposal. Send me an email caribbeanfootball at hotmail dot co dot uk and we can speak further. Cheers.